"Do you love being the center of attention? Do you love saying "on your left"? Then you need a Bamboo bike. My father and I each built a bamboo bike over a month ago and ride them every day. I have a single speed (that see's over 85mi a week) and my ol'man has the beautiful 5-speed on his. The bike absorbs all the road noise that I’m sure you are used to, yet when you crank it the bike is stiff and responsive to every pedal. I will be doing another class after the holidays to build my jealous girlfriend a beautiful bamboo bike too. Yes! We have a workshop coming up this summer! *Scroll down to choose your workshop options! As a small business in Lakewood, we are excited to have you signup for a workshop! ​Please read all of the information before choosing "Workshop Only". 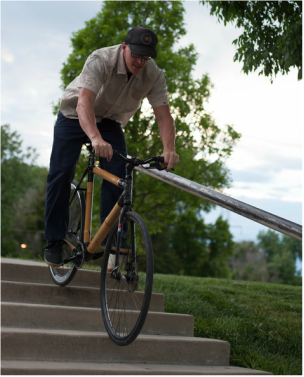 This option allows you to build a bamboo bike frame with us! *We frequently have customers that try to get parts cheaper online but end up ordering parts the wrong size that cannot be returned or you have to pay shipping to send them back.. By purchasing parts through the packages below you are saving 20% off of retail. Also, you will get a completed bike that you will love and trust because it was assembled by our expert mechanics. Save money now while buying local when you signup for a complete workshop and bike parts packages listed below. This way you know your parts will fit perfectly and you will save a little over 20% on all of the components to complete your one of a kind bamboo bicycle! This is a single speed bike with a back pedal or coaster brake. Most components are of aluminum construction. This is not your average cruiser bike. Our completed bikes typically come in at around 24 pounds. This sweet bike that you make will get you where you want to go with style. It has front and back rim brakes, upgraded wheels, bearings, seat, and handle bar choices. Some components also have color options. This is a single speed bike. This "buy now" button​ is payment for the frame building workshop and the parts and labor to finish your bicycle (savings of 20%). ﻿This bike offers a 5 speed internal shifting hub laced to a high quality rear rim. Front and back brakes, metal platform pedals, or SPD. Silver or black color options for most parts. This is a 5 speed bike. This "buy now" button is payment for the frame building workshop and the parts and labor to finish your bicycle (savings of 20%). We encourage you to choose from one of the complete packages listed above. BONUS: You will save 20% off of retail on your parts when you purchase a "package". *We frequently have customers that try to get parts cheaper online but end up ordering parts the wrong size that cannot be returned. By purchasing parts through packages below you are saving 20% off of retail. Also, you will get a completed bike that you will love and trust because it was assembled by our expert mechanic. Contact Russ Hopkins' for other payment 720-437-0638 or email info@thecontainercollective.com with questions. Signing up for any workshop guarantees your place to build a bike. Any payments made for either frame only or complete packages can be refunded 2 weeks (minus a $350 deposit) before the workshops. Note that the $350 will be held from any payment made and you may use that deposit towards another workshop date if there is not a minimum of 2 people signed up for a workshop or you have an emergency. Interested in staying in touch with the community at CCBikes? Sign up for our newsletter to stay on top of current events and happenings, or connect with us on social media.